Sony, with its smallest and lightest Wi-Fi digital camera with interchangeable lens set new standards in the world of photo industry, at least so they say in the company. 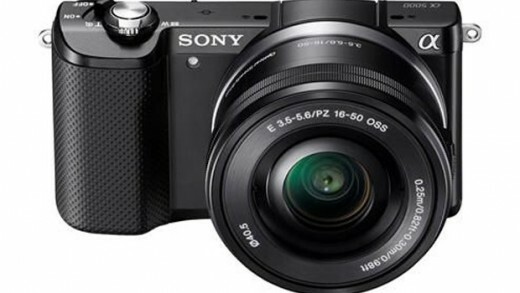 With an effective Exmor APS HD CMOS sensor of 20.1 megapixels and BIONZ X processor, Sony A5000 wi-fi digital camera produces excellent photos despite its size. When creating a model A5000 a serious step forward has been made in synergy of high-quality photos and adaptive design that fits in every pocket. Small and light enough to carry around, is a great replacement for the DSLR camera. Although it weighs only 210 grams, its compact body contains a powerful flash that can record and less lightened scenes. Camera handrail has been redesigned and provides a safe and quiet operation with any E-mount. Image quality of Sony A5000 wi-fi digital camera is enhanced with a DSLR and efficient Exmor APS HD CMOS sensor, size of 20.1 megapixel that can capture every detail. Thanks to the combination of a7 and a7R full-frame camera and BIONZ X processor, it is further enhanced picture quality. Advanced playback, mechanism for reducing noise, and technology that reduces diffraction allow more refined textures and a controlled level of noise no matter where you’re shooting. A level of exposure can be manually set up to ISO 16000 in order to get impressive photos with the effect of fading. Thanks to the LCD screen, which allows an inclination of 180 degrees and an adjustable handle, with Sony A5000 wi-fi digital camera you can effortlessly capture great selfie pictures. Function Soft Skin Effect automatically fix wrinkles and imperfections on the face and you will get a visually more attractive photos. Also, in case of the camera is easily accessible button for optical zoom, so there is no need for additional manual adjustment of the lens, which makes taking photos further facilitated. Wi-Fi implemented in the camera allows you to connect with the Sony Xperia, compatible Android with NFC, or Smart Phone, which allows easier and faster wireless photo sharing. Also with one stroke is possible activation of Smart Remote Controle function, which also connects the camera, smartphone and tablet so you can review captured images and shoot them from a distance. Innovative Camera PlayMemorise applications empower your photographic experience and offer a wide range of free applications and those that you need to pay, which further enhances the effects on photos. Accessories for the A5000 model include the new HVL-EBB elegant holster, LCS-BBN bag and STP XSR1 fashionable belt. LCS-BNN is patent that operate on a ‘bag in a bag ‘, so that could with its practical design fit into a travel bag or suitcase and further protect the camera. Also available is the ACC TRW equipment including BC-TRW charger and NP-FW50 rechargeable battery. Model Sony A5000 wi-fi digital camera fits perfectly multipurpose SEL55210 E55 210mm F4.5-6.3 telephoto lens, available in black.